Beneath the Sea - Underwater Tranquility. Vida en el Arrecife de Coral - Leben im Korallenriff - Sous la mer - Meraviglie del mondo marino - Leven in het koraalrif. 153 x 101 cm 60 x 40 inch. 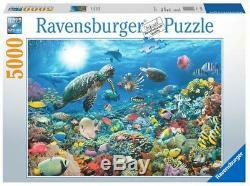 MPN: 17 426 3 / Ravensburger 17426. PUZZLE 5000 PIEZAS - PUZZLE. Visit Our Shop - Visita Nuestra Tienda. 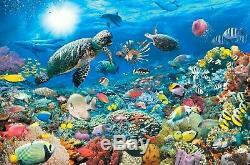 The item "RAVENSBURGER 17426 UNDERWATER TRANQUILITY Beneath the Sea 5000 PIECES JIGSAW" is in sale since Wednesday, February 21, 2018. This item is in the category "Toys & Hobbies\Puzzles\Contemporary Puzzles\Jigsaw". The seller is "shopilandia" and is located in Campdevanol.